Join a Roman slave rebellion in Spartacus Legendary Warrior, a 5 reel, video slot from WMS. The base game engine offers 50 paylines. Land a wild though and 5 more rows open up which doubles the paylines up to 100. There are 3 free spin rounds on offer too that award up to 24 free spins with expanding wilds, multipliers and win all ways pays. Play from between 25p and £100 per spin. The design in Spartacus Legendary Warrior is good. The reels include lower value gemstones as well as axes, shields, Spartan helmets, lions and chariots. The top symbol is the Spartacus logo. Land 5 of these on a payline and you’ll pocket an award of 2 times your bet. Those same payouts are on offer from the wild. As well as replacing all other symbols bar the scatter, it also unlocks the top 5 rows of the reels whenever it hits. The wild expands and fills the whole of its reel as well as increasing the number of paylines in play from 50 up to 100. Recruit Free Spins feature – this is triggered by landing the amphitheatre scatter on reels 1, 3 and 5 on the top 5 rows. You’ll receive 12 free spins with added wilds which expand to fill the whole of the reels when they hit. Hero Free Spins feature – 12 free spins are awarded if you land 3 scatters on the bottom 5 rows. The expanding wilds are in play too. This time they come multipliers up to 5x attached. If you get 5x multipliers on all 5 reels, they will combine to give you a 3,125x multiplier! Legend Free Spins feature – the third free spins round becomes active if you land 3 scatters anywhere on the reels plus a wild. The expanding wilds and multipliers from the Hero Free Spins feature are in play. You’ll also get win all payouts rather than simple payline rewards. The film version of Spartacus has become a classic. This video slot version doesn’t quite hit those heights but it’s still a very playable game thanks largely to the expanding wilds and the trio of free spin rounds – especially with the potential 3,125x wild multipliers! 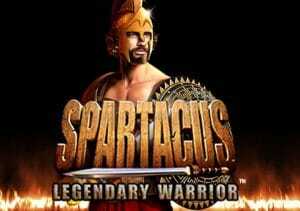 If you like the Roman theme, then Spartacus Legendary Warrior is worth a spin. I would also recommend you try Quickspin’s Tiger’s Glory.